All Time Low is an American pop punk band from Baltimore, Maryland, formed in 2003. The band consists of vocalist and rhythm guitarist Alexander Gaskarth, lead guitarist and backing vocalist Jack Barakat, bassist and back vocalist Zachary Merrick, and drummer Rian Dawson. The band's name is taken from lyrics in the song "Head on Collision" by New Found Glory. Formed while still in high school, All Time Low started out covering pop punk bands such as Green Day and Blink-182. 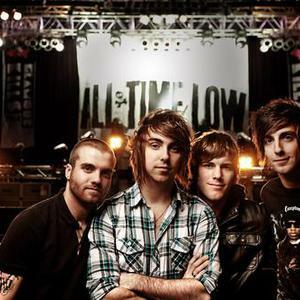 Formed while still in high school, All Time Low started out covering pop punk bands such as Green Day and Blink-182. They signed their first record deal with Emerald Moon Records in 2004 and released their first EP, titled The Three Words to Remember in Dealing with the End later that year. Their first studio album, The Party Scene, was released July 2005. Before graduating high school in 2006, they signed a record deal with Hopeless Records and re-recorded songs from their debut album and included two new songs for their EP Put Up or Shut Up. The EP entered both the Independent Albums and Top Heatseekers charts. On July 7th, 2009, All Time Low released their third album, titled "Nothing Personal." It was released on Hopeless Records. Hopeless released the EP "Put Up or Shut Up" in 2006, which became the band's first record to reach the charts, peaking at number 20 on the US Top Independent Albums chart. On September 25th, 2007, they released their second album "So Wrong, It's Right", which became their most commercially successful, peaking at number 62 on the Billboard 200 and number 6 on the Top Independent Albums chart. Their second single from the album, "Dear Maria, Count Me In", peaked at number 86 on the Pop 100. Their most recent album, "Nothing Personal", has two singles entitled "Weightless" and "Damned If I Do Ya (Damned If I Don't), which peaked at 67 on the Billboard Hot 100. The third single is "Lost in Stereo". The album was released July 7, 2009, peaking at number 4 on Billboard. It was revealed in November 2009 that the band had signed to major label Interscope Records. The band also announced that they would have a song titled "Painting Flowers" featured on the soundtrack for the upcoming film Alice in Wonderland, and released a live EP to iTunes. In December 2009, the band won the Best Pop Punk Band at the Top In Rock Awards. On April 27th, 2010 they released a live version of the hit "Lost In Stereo" that included live video footage from a concert. In late March 2010, All Time Low began recording their fourth studio album with producers John Fields, Matt Squire and Mike Green. It will be the band's first album released through Interscope Records. The band's concert at Hammerstein Ballroom in New York City on December 4, 2009 was recorded and subsequently released in 2010 as their first CD/DVD, entitled Straight to Dvd. The release includes an on-the-road documentary filmed during All Time Low's October?December 2009 headlining tour, a live concert audio CD and out-takes of the band. It was released on May 25. The band has confirmed that their fourth studio album and first Interscope Records release will be released sometime in January 2011. On July 28, Alex announced via twitter that they have officially finished tracking all 14 songs for the album. A demo song tentatively titled "Actors" was posted on earthtoalex.com on August 17, 2010. It was later confirmed in an interview that this song will not be included on their 2011 release Dirty Work. All Time Low's fourth studio album will be called "Dirty Work". The release of Dirty Work has been further postponed many times and now the confirmed release date is 7th June 2011. They have also released a singles for the album called ' I Feel Like Dancin' ' and 'Forget About It' both of which are accompanied by music videos. The band is currently in Los Angeles recording their fifth studio album.